Città del Tricolore Award - Benvenuti su iz4isk! 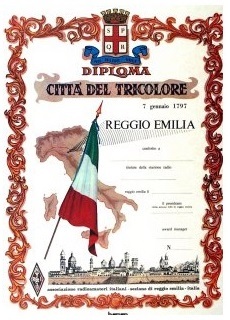 The "Città del Tricolore" Diploma was established on 1 January 1974 to remember the TRICOLORE, born in Reggio Emilia on January 7, 1797. "...The Three-Color, Green, White, and Red Banner or Cispadana Flag becomes universal, and these three Colors are also used in Coccarda Cispadana, which must be brought by everyone" (Cispadano Congress of January 7, 1797). The first tricolor was horizontal bands: red, white, green. At the center was the coat of arms of the republic Cispadana, the roll of the four arrows, to represent the citizens of Reggio, Modena, Bologna, Ferrara who had given birth to the first sovereign state after centuries of submission. In 1848 it was chosen as a symbol of the national flag. Per OM Italiani 10 collegamenti diversi con stazioni di Reggio Emilia. Per OM Europei 5 collegamenti diversi con stazioni di Reggio Emilia. Per OM di altri Stati 3 collegamenti diversi con stazioni di Reggio Emilia.